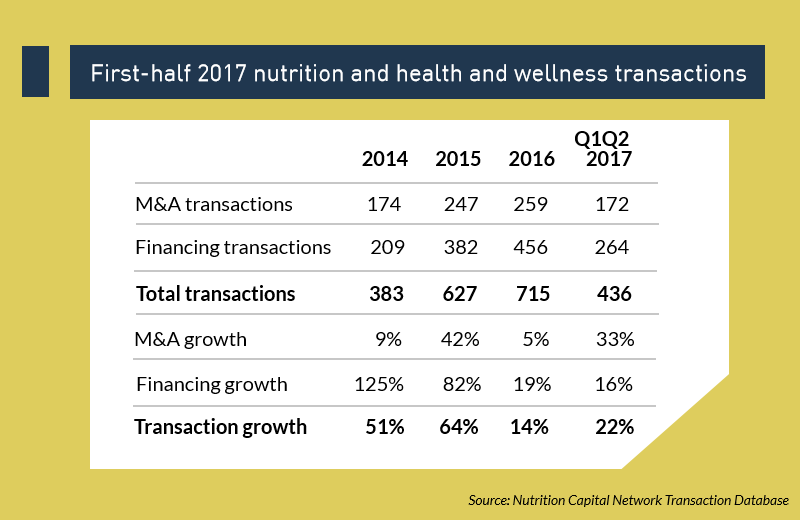 The first half of 2017 is adding up to be a record year for nutrition and health and wellness industry investment transactions. Dive into the numbers and learn the food and nutrition trends attracting investors. The nutrition and health and wellness industry saw a 22 percent increase in transaction activity in the first half of 2017, according to Nutrition Capital Network (NCN), an organization that connects investors with high-potential growth companies in the nutrition and health and wellness industry. The NCN Transaction Database revealed that, by midyear, mergers and acquisitions (M&As) were up 33 percent and financing transactions increased 16 percent compared with 2016’s annualized pace of transactions. NCN tracks two categories: mergers and acquisitions or changes in ownership or control, and investment or equity financing (excluding debt or non-cash strategic partnerships) from around the world. The NCN Transaction Database recorded a total of 436 transactions in the nutrition and health and wellness industry from January to June 2017 compared with 715 in the whole of 2016 and 627 in 2015. This year has the potential to improve dramatically on the record highs of the two prior years. NCN began tracking the industry in 2014. Amazon agreed to buy Whole Foods Market for $13.4 billion. L1 Retail agreed to purchase the Holland & Barrett health store chain from The Nature’s Bounty Co and The Carlyle Group for £1.77 billion. Danone of France completed the acquisition of WhiteWave Foods, the owner of Silk soymilk and Horizon Organic dairy brands, for $10.4 billion. Lonza completed the acquisition of Capsugel for $5.5 billion. Maple Leaf Foods acquired Lightlife Foods for $140 million. Glanbia invested €181 million to acquire Amazing Grass, positioning Glanbia in the plant-based nutrition market, and Body & Fit, a direct-to-consumer business focused on performance nutrition. Nutraceutical International (Solaray, KAL, Natural Balance, Health from the Sun, Monarch Nutraceuticals, etc.) was taken private by HGGC in $446 million deal. Nutrition Capital Network reported sustained momentum in natural, organic and functional food and beverages, which saw mergers and acquisitions increase by 26 percent and financing by 25 percent in the first six months of 2017, setting the segment on course to top 2016’s record pace. Other segments of note showing a demonstrable increase in M&A transactions included retail and distribution, ingredients and supplements, all three of which are also on track for record years. “That the pace of transactions in natural and organic foods in 2007 continues to exceed previous years’ records is indicative of the strength of this category and the fact that the emerging battleground in the global food business is healthy foods,” noted Grant Ferrier, chief executive officer of NCN. Technology and food tech has been the growth engine for financing transactions over the past few years, but this trend finally slowed in the first half of 2017, according to the NCN Transaction Database. Within the technology segment, delivery service and apps held their own in terms of transactions closed so far in 2017, but there were notable fall-offs in ecommerce and software, in addition to analytical, diagnostic and monitoring devices. Altogether, the number of financing transactions in technology and food tech looks set for a 13 percent decline in 2017 based on first-half data. Nutrition biotech and ag tech appears to be the new growth engine, driving high numbers of financing transactions in 2016 and pacing 24 percent growth for 2017 (on track for a three times gain over 2016). Kellogg’s venture arm eighteen94 capital recently chose Bright Greens, a maker of frozen vegetable and fruit smoothie products, as its second investment, following an investment in January 2017 in superfood company Kuli Kuli, which makes snacks based on moringa leaf. Unilever Ventures made three investments in the first half of 2017, leading a $9 million round for organic meal kit startup Sun Basket, in addition to investing in nutraceutical hair loss supplement brand Nutrafol and True Botanicals in personal care. General Mills’ venture arm 301 INC added to its portfolio with two acquisitions in March: D's Naturals plant-based snack bars and Farmhouse Culture, which makes probiotic food and beverages. The Hain Celestial Group purchased The Better Bean Company, the first strategic acquisition by its venture arm Cultivate Ventures. In the ingredients segment, DSM Venturing led an investment in NutriLeads (proprietary ingredient for immune function); and chickpea protein company Nutriati Inc. received an $8 million financing led by Tate & Lyle Ventures and Powerplant Ventures. Europe launched the Pepsico Nutrition Greenhouse incubator for emerging nutrition brands in the food and beverage sector. Rabobank launched a VC fund for innovative food and agriculture. Mexican baking company Grupo Bimbo launched Bimbo Ventures, in addition to a food incubator; IKEA in Sweden also announced a food incubator project. In dairy, Land O'Lakes launched an accelerator program to spur dairy innovation. Unilever was not the only actor in meal kits when it led a $9 million investment in Sun Basket in May. Together with the $15 million investment led by Sapphire Ventures earlier in the year, Sun Basket raised its Series C total to $24.2 million. Nestlé led a $77 million investment in Freshly, a purveyor of direct-to-consumer healthy prepared meals. Campbell announced a strategic partnership and $10 million investment in Chef’d personalized meals, in addition to making an innovation play in Habit, which customizes meals according to biomarkers and genetic predisposition. However, the Amazon-Whole Foods deal added further complexity to the meal delivery business and likely contributed to a reduction in share price and proceeds raised by Blue Apron’s June 2017 IPO. Silicon Valley’s Sequoia Capital and Chinese investors Tencent, CITIC and more recently Alibaba. DayTwo, a sequencer of the gut microbiome to create personalized nutrition solutions. Anaeropharma Science, a company developing genetically enhanced bacteria to destroy cancer tumors. Both companies proved a fit for Seventure’s Health For Life Capital investment vehicle. “With a market predicted to be worth over half a billion US dollars by 2022, investing in microbiome-based companies is now rapidly becoming mainstream, with an exponential growth of innovative companies being founded to develop products based on new biological insights,” observed Isabelle de Crémoux, Seventure’s CEO and managing partner. RoundTable Healthcare Partners invested in Deerland Enzymes & Probiotics. General Mills’ 301 INC venture arm led a $6.5 million Series D in probiotic food brand Farmhouse Culture. i-Health Inc., a subsidiary of Royal DSM, agreed to purchase the UP4 Probiotic consumer brand from UAS Laboratories. DuPont Nutrition & Health announced a $60 million investment in European production to meet demand for frozen and freeze-dried starter cultures from the global yogurt, fresh fermented and cheese markets. JustFoodForDogs, a retailer of small batch, home-cooked pet food, received a significant growth investment from NCN Cornerstone Investor LCatterton. The Farmer's Dog, a direct-to-consumer fresh petfood company, closed an $8.1 million Series A financing led by Shasta Ventures. Spectrum Brands Holdings acquired PetMatrix, a manufacturer and marketer of rawhide-free dog chews. PetLife Pharmaceuticals acquired Healthy Life Pets (Dr. Geoff’s Real Food for Pets). Whitebridge Pet Brands acquired Arthur Dogswell LLC. More sectors showing notable transaction activity in the first half of 2017 included vertical and indoor farming, alternative sweeteners and nutraceuticals for hair.